A Southern-style baked macaroni and cheese is a fabulous dish to serve as a side or main dish. It's easy and begins with a made-from-scratch cheese sauce that takes very little time to prepare. The breadcrumb topping finishes it off perfectly and it's sure to be a new family favorite. This dish is an excellent choice for any meal or occasion. Serve the macaroni and cheese as a side dish with fried chicken, burgers or hot dogs, barbecue, or a holiday dinner. On a busy night when you're in the mood for a lighter meal that will still fill you up, it's a perfect choice as well. Simply serve it with a side salad and bread and dinner is served! To brown the bread crumbs a little more, turn the broiler on for a minute or two just before taking the casserole out of the oven. Just be sure to watch carefully for signs that the topping is getting too dark. Cook macaroni following the package directions. Drain in a colander and rinse with hot water; set aside. Butter a 2-quart baking dish. Heat oven to 350 F.
In a saucepan, melt 4 tablespoons of butter over medium-low heat. Stir flour into the butter until smooth and bubbly. Stir in the dry mustard, salt, and pepper. Gradually add milk and cream, stirring constantly until it has thickened. Add cheese and continue to cook and stir until melted. Combine the macaroni and the sauce and turn it into the prepared baking dish. In a small bowl, toss the breadcrumbs with melted butter. Sprinkle the casserole with the buttered breadcrumbs and bake for about 25 minutes, or until hot and bubbly and the topping is lightly browned. 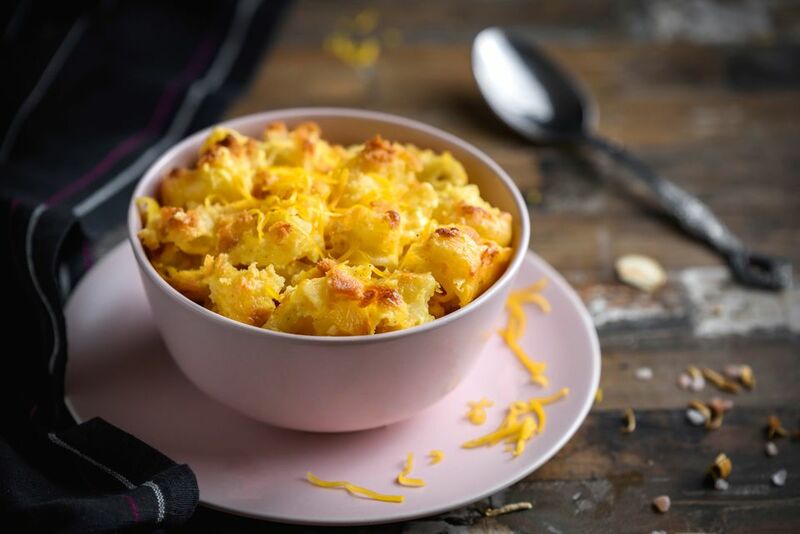 If you're short on time, you might like this easy, old-fashioned macaroni and cheese bake—there's no sauce to fuss with. Breadcrumbs can be made with just about any bread product. Use white bread, whole wheat, croissants, or soft pretzels. Use the pasta of your choice. Whole wheat elbow macaroni is a great alternative to regular macaroni. You can use mini penne, ditalini, or similar pasta shapes as well. Create a layer of bacon inside the casserole. Cook 4 or 5 strips of bacon and drain well, then crumble it. Pour half of the macaroni and cheese into the baking dish, sprinkle bacon on top, and then finish it with the rest of the macaroni and cheese and breadcrumb topping. Use a blend of cheeses or a substitute. Cheddar, American, and Colby cheeses make a nice combination. You can also replace the cheddar with shredded pepper jack cheese or taco-seasoned cheese.